Breakfast can get boring easily. At least for me. I’m not a morning person. Actually, I’m currently blogging at 2am – so that should tell you something of my preference between day and night. Also, should make you cut me some slack if anything in this post makes no sense. Since I don’t drink coffee, mornings find me stumbling around praying I get most of the cereal into my kid’s bowls & not all over my floor. I decided to make a breakfasty bread to take some of the annoying edge off the first few minutes of being awake. Made the night before, and all ready to go in the wee hours of the morning. Ok, ok…my kids sleep until around 8:30 every day. God loves me, what can I say? Breakfast bread made me think of cinnamon raisin toast. But that wasn’t what I had in mind. I needed more. About the only other thing I like with raisins (besides cinnamon) is apples. 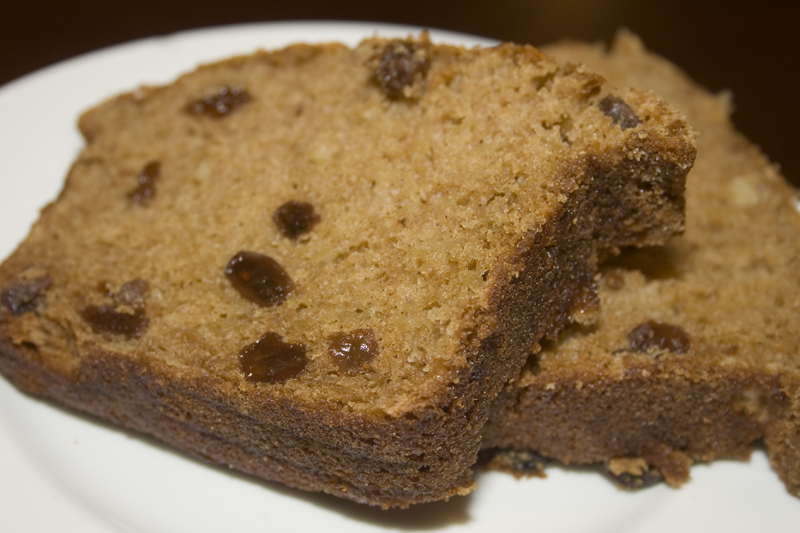 So a cinnamon-y spiced apple raisin breakfast bread was perfect! This bread comes together quickly and fills the house with a warm fragrantly spiced scent as it bakes. You could easily make muffins out of it instead of a loaf f that floats your boat. It is full of apple deliciousness and a tiny hint of orange mixed in with the cinnamon. Yum yum yummy. 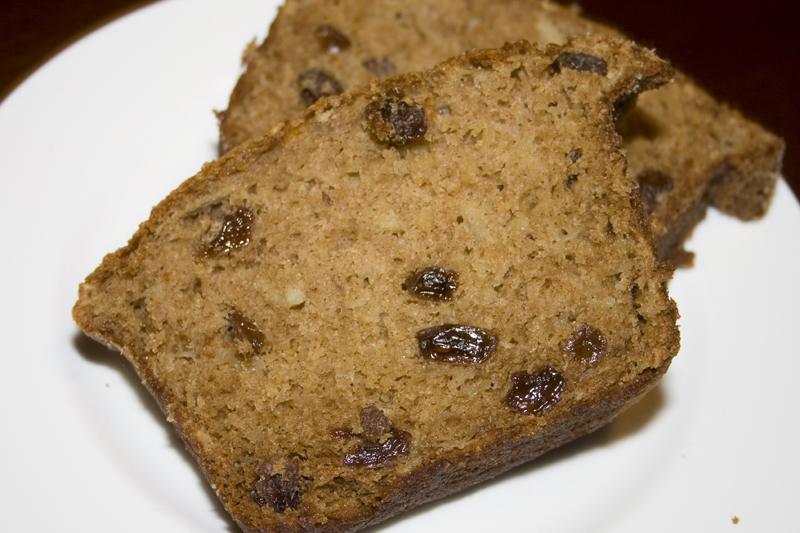 Before you mix anything else – give some raisins a bath in a little bit of orange juice. We’re going to mix up the batter while the raisins plump up. 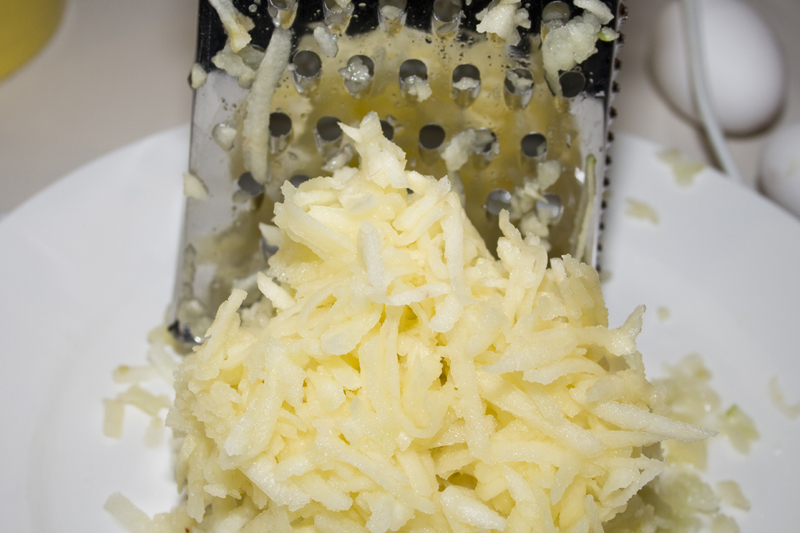 You can substitute butter in place of the applesauce and oil if you like. I just find that butter breads, while full of flavor, lack the moistness I love in a sweet bread. Since this bread is chock-a-block full of flavor from the other ingredients, I went sans butter. I don’t like a whole heap of oil though so I did half applesauce. Seemed to make sense in an apple bread. 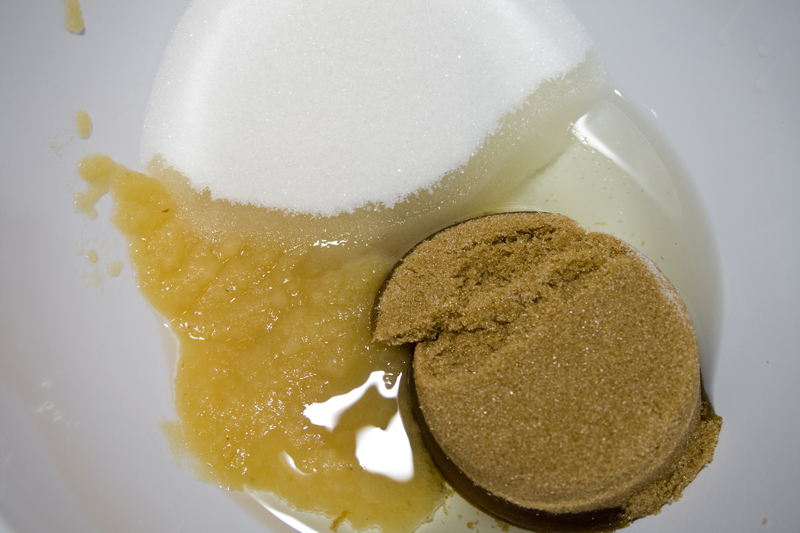 Add with two kinds of sugar and mix. Add a couple of eggs. 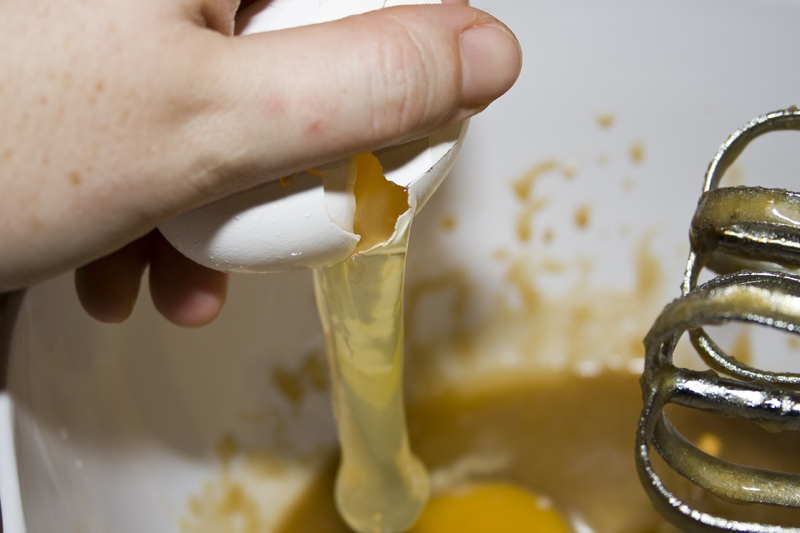 Sometimes, I crack eggs with one hand. Just to prove to myself that I still can. And some dry ingredients, including a good measure of cinnamon. Shred up some apples. I like this better than chopping because it makes the apples just melt into the bread while it bakes. You get the flavor, without the chunks. Who likes chunks in their soft moist bread? Not me! 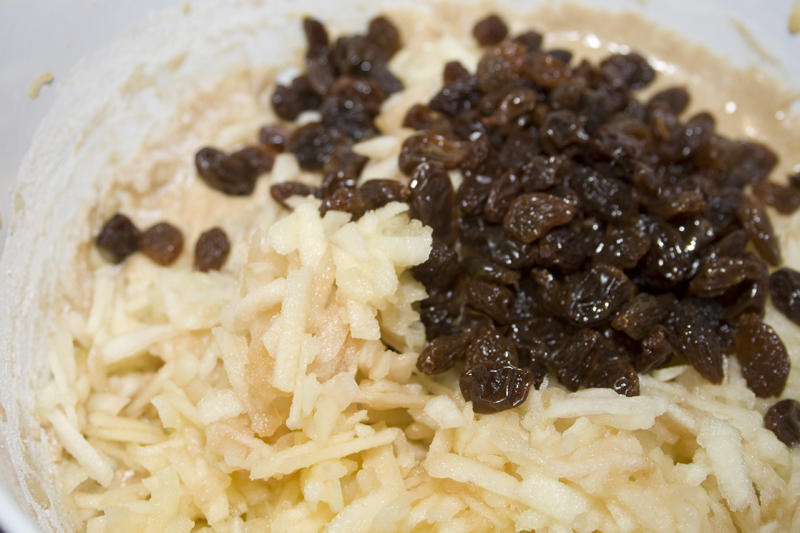 After you’ve blended the wet and dry ingredients and drained the fattened raisins, mix it all together with the apples. I wish fattening up in real life was as appealing as raisins gaining a rotund look. And into a loaf pan to bake. I did a little experiment with this, used some cinnamon sugar I had lying around to “flour” my pan. It turned out amazing! Just a hint of crispness around the edges! Bake, cool and slice. Enjoy! Preheat oven to 350 degrees F (175 degrees C). 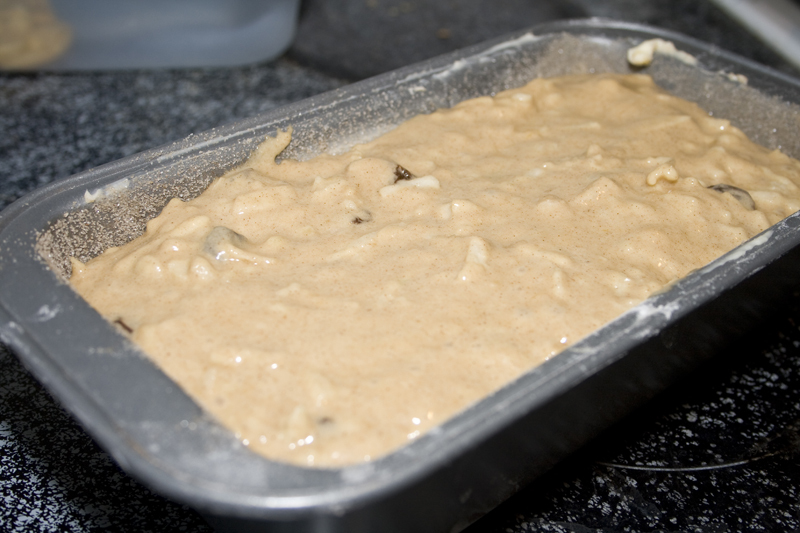 Lightly grease & flour an 8×4 inch loaf pan. 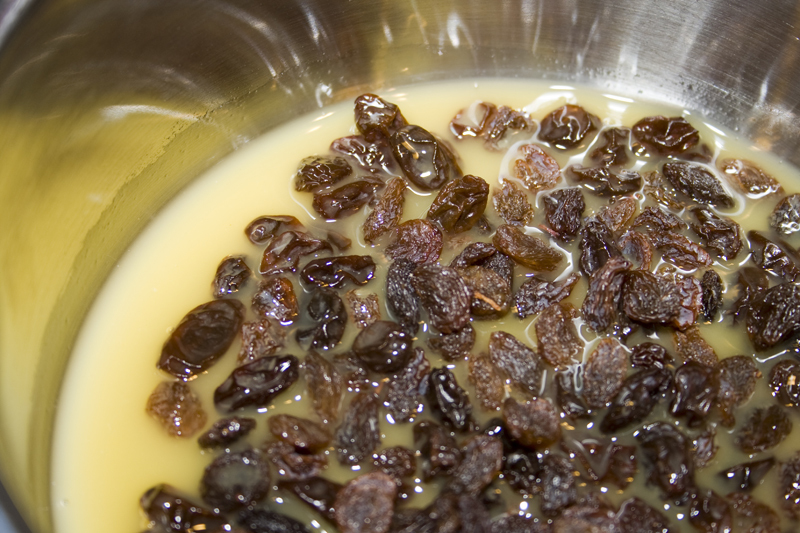 In a small saucepan over medium heat, bring orange juice and raisins to a boil. Drain. In a bowl, mix the oil, applesauce and sugars until smooth and creamy. Beat in the eggs. 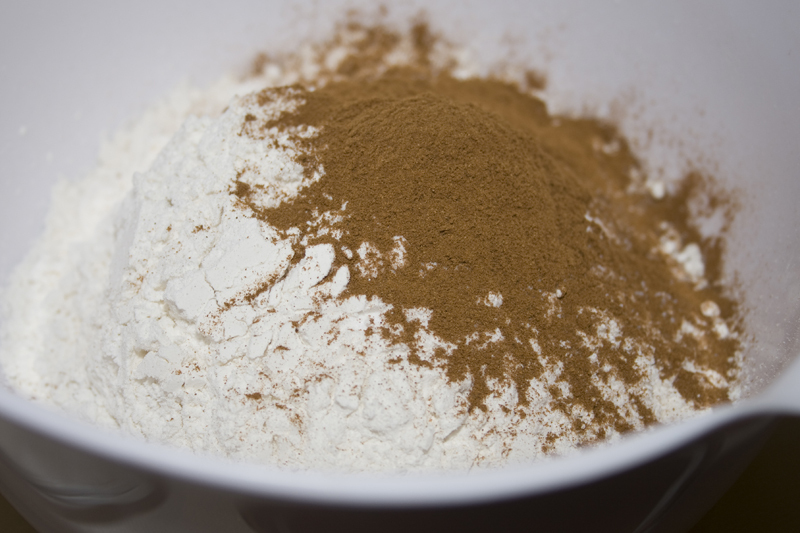 In a separate bowl, sift together the flour, baking soda, salt, and cinnamon. Mix into the wet mixture until moistened. Fold in the apples & the drained raisins. Transfer to the prepared loaf pan.